Working out the Theory of Change for your service is best done as a team. It will take a lot of debate, but people can get excited about it. Walk backwards to get where you want to go! Here is a quick explanation as to What is a Theory of Change. 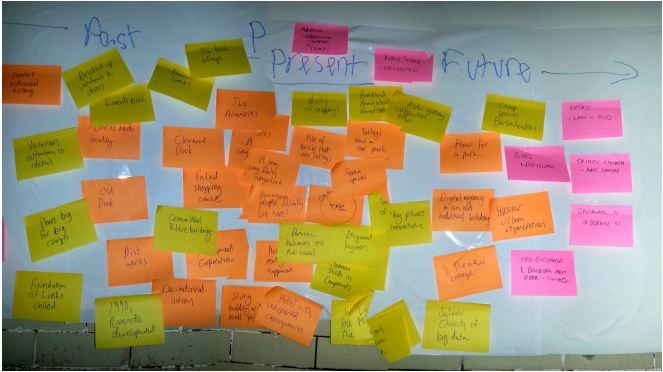 In the beginning a Theory of Change looks like a map made up of sticky notes with outcomes written on it. It’s the story of how your program is designed and how it is supposed to work. It’s best to create a Theory of Change before you’ve decided how your program will be constructed: you start with the long-term outcome you want to see and work backwards to work out how it will be achieved. It’s a way of designing a new program. Under the Outcomes Framework organisations are being asked to produce a Theory of Change for DHHS-funded programs. You might find that difficult – you might not have had to think about your program in this way before. But a positive thought is that you can view creating a Theory of Change for an existing service as an opportunity to test the structure and logic of your program – it could lead to service improvements. Now you know the problem you can start. Here’s a step by step guide on how to develop a Theory of Change. Think in headlines What would the headline of the newspaper be if you were to achieve the outcome you hope for? Be as specific as you can be. It will help your precision if you discipline yourself to writing the outcomes on a sticky note. This next step sounds straight out of Dr Seuss but it really does work best to work backwards from your long-term outcome. First step: Next part of the plan? This may sound strange if you are used to planning ‘to achieve my goal I’ll take this step, and when that’s done, I’ll take the next step’. To write a Theory of Change you do ‘backwards mapping’. You look at what you want to achieve in the long term and ask yourself 'what has to change for that to happen?' and 'what outcome needs to have already been achieved?' Eventually you map your way back to the earliest changes that have to happen. What needs to happen for young people to get meaningful long-term employment? They need to be job ready, and they need to increase skills which will help them get work. That’s our next layer of outcomes. What needs to happen for young people to be job ready? What needs to happen for them to increase their skills? They need to deal with the issues in their lives. They need to engage with school. They need the chance to do work placements. They need mentoring. Most Theories of Change have three or four levels of outcomes – that seems to be enough for people to understand the plan needed to reach the long-term outcome. Hint: when you are mapping your Theory of Change don’t put things in just because they are good or because they are how you are currently doing them. Ask yourself whether they are getting you where you want to go. As you are working out your sequence of outcomes you will see many things that need to happen or exist for your program to work. These could be policy, social, family or cultural factors eg for young unemployed people to get to our service they will need transport and they will need welfare support payments so they can pay for transport. We are assuming that these are in place for our program to work. Make notes about all the assumptions because some of them might need to be tested − can we assume that all your clients have access to transport? Now that you have a map of the outcomes you are hoping to achieve, you need to work out what you are going to do. What strategies or interventions are needed to make these outcomes happen? You need to draw a line across your map to show what you and your program can be held accountable for (‘The Line’). You are responsible for the short- and medium- term outcomes of your project. Long-term outcomes generally need a great deal of time, and a lot of strategies. These are Government’s responsibility. You can only plan and evaluate against what your service is accountable for. In the DHHS Outcomes Purchasing Framework, the Population Level indicators sit above The Line. You will need to negotiate Performance Indicators for the specific outcomes on your DHHS Outcomes Statements which should draw on key outcomes in your Theory of Change. Ideally you would establish an indicator for every outcome on the map that you are responsible for, that is, that are below The Line. If you are using an independent evaluator, make sure they are involved in this step. For more on indicators, see How to develop performance indicators. This is the step where you write the Theory of Change down as a story. It’s your chance to tell a compelling story about why this program is going to work. You can explain how the change will happen, what assumptions or research you have based it on, and what you are going to do. Sometimes a Theory of Change will also tell you something about an organisation’s history and vision. Young people in our community face a depressed local economy and very high levels of youth unemployment. Some young people are particularly disadvantaged in making a transition from school to work because of histories of trauma and disengagement from school. Emu Bay’s Youth Services are committed to helping our young people achieve their potential. Emu Bay’s Youth Services help young people to find meaningful long term employment through providing mentoring, school support, tailored work placements to increase their skills and through case coordination which supports them to deal with the issues affecting their lives. The success of this service is dependent on the program engaging and maintaining the support of volunteer mentors, local businesses and schools and young jobseekers continuing to receive support from the Government. Remember: this is where the Theory of Change becomes a communications tool so keep it brief, easy to read, and easy to understand. In the DHHS Outcomes Purchasing Framework, the Theory of Change that you develop for your funding agreement need only be 4 or 5 dot points. Note: If you go looking on the internet you will find people arguing that a Theory of Change is not the same as a Program Logic even though they agree that there are lots of similarities and that they are easily confused. 3 The TasCOSS best practice advice is: there are more similarities than differences. Use what works for you. Hint: Working out the Theory of Change for your service is best done as a team. It will take a lot of debate, but people can get excited about it. Hint: How do you know if you have a good Theory of Change? When you read it, it sounds plausible, you can actually do it, and you can test it. Hint: A Theory of Change isn’t set in stone. Look at the information you are collecting about if and how your program is working. Revise your theory or your program.